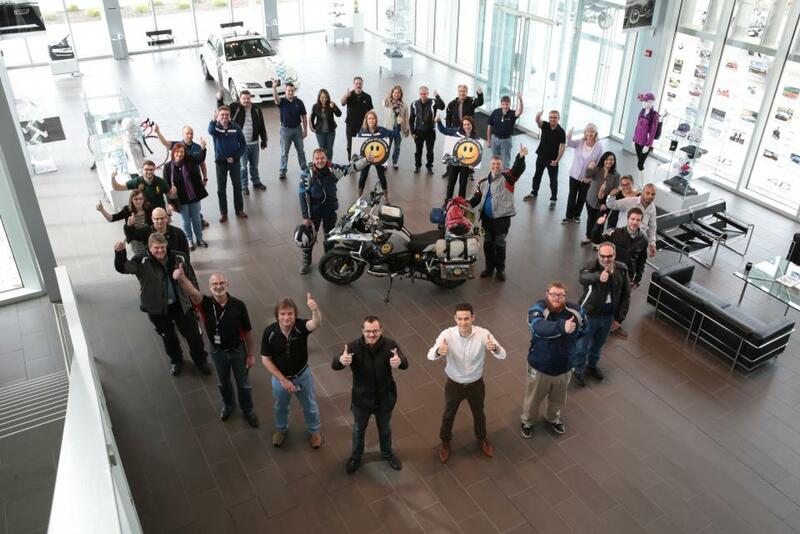 Woodcliff Lake, NJ – May 15, 2015…Employees of BMW of North America, L.L.C. welcomed Dr. Hans-Henning Buetzow to BMW’s corporate headquarters today and gave him an official send-off for his charity motorcycle ride that will traverse 50,000-miles and raise an anticipated 50,000 euros for children in need throughout the world. Dr. Buetzow will complete his Ride of Smiles journey aboard a BMW R 1200 GS Adventure motorcycle. His route, which will trace a symbolic 50 on the world map, will take him across North, Central and South America as well as Australia and New Zealand. His goal is to raise at least 50,000 euros for four charitable organizations: Doctors Without Borders, Christian Blind Mission, United for Africa, and Sternstunden, the Bavarian TV and Radio Broadcast. A resident of Heidelberg, Dr. Buetzow is an experienced and enthusiastic motorcycle tourist, who has been traveling the world on two wheels since 1989. Impressed by the enormous hospitality and joy of life shown by the people he meets on his travels, he was inspired to give back to those less fortunate through his Ride of Smiles. Donations can be made directly to the four charities or via the Ride of Smiles website (www.ride-of-smiles.de).